Pipe Flow Expert is our premier software program for piping design and pipe system modeling. It calculates fluid flow in open or closed loop pipe networks with multiple supply & discharge tanks, multiple pumps in series or in parallel, and multiple pipe sizes & fittings. Pipe Flow Expert will calculate the flow rate in each pipe & it will calculate pipe pressure drop throughout your system. Do you need to calculate pipe flow rates? Do you need to calculate pipe pressure drops? Buy a Pipe Flow Expert Software License and be up and running in less than 2 minutes. 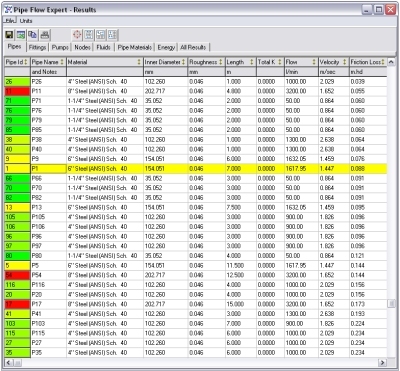 Why Choose Pipe Flow Expert Software for flow & pressure drop calculations? Well, as a software application for modeling pipe system flows and pressure drops you'll find it hard to beat. It can model both open loop and closed loop piping systems, with multiple supply tanks and discharge points, multiple pumps in parallel or pumps in series, and it comes with its own pipe database, fittings database and fluids database. And most important of all, it is easy to use, taking the pressure out of piping design, pipe flow calculations, and pipe pressure drop analysis. Your excellent product is simply superb... let me say that I cannot speak highly enough of PipeFlow, your support and your products. Pipe Flow Expert is used by piping design engineers in over 100 countries worldwide. Pipe Flow Expert has simply the most intuitive and best-in-class user interface of any piping design and analysis program anywhere, as our customer testimonials confirm. You won't find a comparable software program with the same capabilites that allows you to get up and running as quickly. We put ease-of-use as a main priority and designed the software from the start with a focus on the end user, to make it simple to use while maintaining the powerful underlying capabilities of the application. It has a very powerful and reliable calculation engine that provides accurate flow rate & pressure loss calculations, which is why it is trusted by users in over 100 countries worldwide. Pipe Flow Calculations that are almost impossible to perform by hand or by using a spreadsheet are now easily solved with Pipe Flow Expert, to give you instant answers, improving the accuracy of your results, avoiding costly error-prone spreadsheet models, giving you confidence in your piping design and providing a record of your design documentation. It provides unbeatable value-for-money that quickly returns the cost of purchase many times over, saving countless hours of engineering time and effort. Use Pipe Flow Expert to document your design, provide a standard method of pipe system analysis for your engineers, provide your sales engineers with a powerful visual aid that will help them close sales and give your customers confidence in your solution. 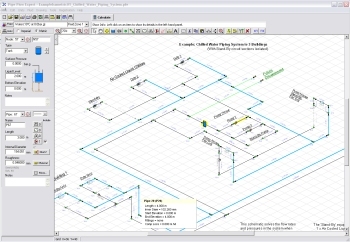 No other piping design software makes it as easy as Pipe Flow Expert does to get up and running quickly, with over 30 example pipe systems, a Quick Start User Guide, a full reference User Guide, and an amazingly intuitive and easy-to-use interface, you'll be saving time and effort right from the start. If your work involves designing or sizing pipe work, calculating pump head requirements or trying to find the flows and pressure losses throughout a pipe network then rest assured that we understand how difficult your job can be. Not knowing the answer to a question asked by a client, or worse, giving the wrong answer can lose you a customer and put you and your company under pressure. However, now there is an easy way to calculate the flows and pressures in your pipe system- get Pipe Flow Expert. Pipe Flow Expert has revolutionized the way we design, bringing a level of expertise to our work that has been instrumental in helping us to achieve greater energy efficiency in our fluid systems. You'll save time and effort, get more accurate design calculations and win more business. Draw out your pipe design, specify the pipe materials and sizes, select the fluid data and then ask Pipe Flow Expert to analyze and calculate the pressures and flows at every point in your system. 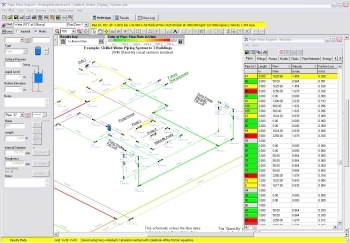 The Pipe Flow Expert software package is designed to be intuitive, easy-to-use & reliable. It provides instant results and solves your pipe design with one click of the 'Calculate' button. Our range of Pipe Flow software programs are used by engineers in over 100 countries worldwide. Our premier Pipe Flow Expert application alone is used in over 100 countries. Engineers ranging from individual consultants through to large middle east oil companies trust Pipe Flow Expert to provide the flow and pressure loss calculation results they need. Pipe Flow Expert has a robust and reliable calculation engine that "solves" your system according to the governing laws of flow continuity and energy conservation. The final flow and pressure results are verified by a second algorithm that re-calculates the pressure at each node based on the pressure at each connected node minus the pressure loss through the connecting pipe for the given flow result. This verification process checks that the pressure results at each node calculate to the same value irrespective of which path through the network is used for the calculation, and hence this validation confirms the accurate solution of the pipe network. Pipe Flow Expert is used by clients in a variety of industries including aerospace, chemical processing, education, food and beverage, general engineering, mining, petrochemical, pharmaceutical, power generation, water and wastewater processing. It will solve both open and closed loop systems with multiple pumps in series or in parallel. It can handle multiple supply tanks and in-flows, multiple discharge points and take-offs, multiple components and fittings, including bespoke items with their own flow versus pressure loss data, and in addition it can cater for up to 9 different fluid zones within a system (but it does not calculate two-phase flow; the user must specify the fluid density and viscosity data for each fluid zone, or select a fluid from the built in fluid database). When designing a new pipe system or analyzing an existing piping network, it is critical to understand the interaction of pipelines, controls, pumps and other components. Our Pipe Flow Expert fluid flow analysis software will allow you to design, troubleshoot and optimize your fluid piping systems by providing a clear view of how your piping system operates. Pipe Flow Expert provides insightful visual results and solutions to even the most complex piping systems. When the piping design is solved the solution values are shown on the pipe schematic and the units to be displayed for any particular calculations, such as flows, pressure, friction losses, etc, can be chosen individually. Whether you are in the USA, Europe, Africa or Australia, you can select your local unit of choice for any item. Users get to see the calculated results on the actual pipe system drawing where the color coding and graphical representation of the piping model gives them an instant visual analysis of their piping design, the flow rates, the pressure losses, and the operating points of their pumps. Pipes and nodes can be drawn against a color gradient that is specified for a particular calculation, such as the volume of flow in a pipe, the pressure drop in a pipe, the friction loss in a pipe or other results data, making it easy to highlight and instantly see any problem areas. To show more detailed information about a specific item on the Results Drawing, simply move the mouse to hover over the item and a pop-up panel appears that lists all of the associated data and calculation results. When the user wants to see the calculation results in a tabulated list, the PipeFlow Expert results can be viewed on the Results Grid in spreadsheet format. The Results Grid and the Pipe System Drawing are interactive and clicking on an element in one of these causes the same element to be highlighted on the other. This makes it very easy to analyse individual items and problem areas within a piping design. The software provides an easy 'select and zoom to' capability that allows selection of a row on the Results Grid and instant 'Zoom to' functionality, which displays and shows the selected item in the centre of the pipe system drawing. All of the data from the Results Grid can be instantly exported to Microsoft Excel with one click of the mouse. This allows client customisation of results data and bespoke report formatting, together with the additional ability to use Excel mathematical functions on a range of values, such as for summing friction losses or energy losses through a group of pipes. 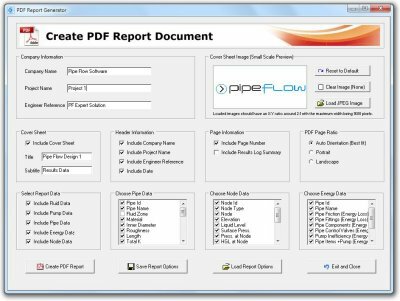 Pipe Flow Expert can generate a professional customized PDF report that documents your pipe system design. With just a few mouse clicks the user can choose to include your company logo on the report cover sheet, select which types of pipe system data to generate, and select individual pipe results data to display in tables. You can use the amazing PDF reports for internal pipe system design documentation, system design presentations, or email them to clients as part of a quote. However you use them, you'll find that being able to instantly generate professional PDF documentation of your piping system design has many benefits for your business. It is almost impossible to accurately solve even a small pipe network using hand or spreadsheet calculations, even if you are a mathematics genius, simply because of the complexity and the number of mathematical iterations that are required to converge to a verifiable solution. Pipe Flow Expert takes the pressure out of performing fluid flow calculations, using it's advanced modeling and calculation engine it will solve the steady state balanced condition for the flows and pressures throughout your pipe system. The software comes with a Pipe Flow Expert Results Verification Document that compares the results from over 50 published cases against the results produced by Pipe Flow Expert when modeling the same system. The overall results compare very favourably and Pipe Flow Expert is even able to highlight issues and errors in some of the published data, which have later been proved to be incorrect or acknowledged as printing errors. We operate a 'try before you buy' policy, which allows you to Download Our Pipe Flow Expert Software for a free trial. The software comes with over 30 example systems that you can load and solve to see the types of calculations and results that Pipe Flow Expert can produce. There is also a Quick Start Guide and with our intuitve user interface you'll be up and running in no time. What are you waiting for? Download Pipe Flow Expert now and see how it will save you and your company hours of time and effort. It could be the best investment you make this year, so try it now and stay ahead of your competitors.